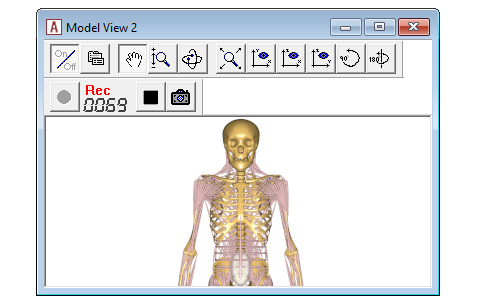 In this post, I will show a new AnyScript template to create awesome videos of your musculoskeletal simulations with a single click. Previously, I often spent hours creating videos for presentations, etc.. Now it takes me 10 minutes. Besides being easy to use the plugin also supports somewhat complicated setups where the camera follows the particular parts of the model or moves around the scene. Before we talk about the plugin, let me just show how to create videos the normal way. The toolbar of “Model View” window in The AnyBody Modeling System has a small record button. It doesn’t record a video directly, but saves every frame as individual images. Once you have all the images, you need to convert them into a video. There good programs for doing this. The easiest solution is probably VideoMach which has a nice graphical user interface. Unfortuantly, the free version adds small watermark to the start of your videos. An even better alternative is FFmpeg. It is purely command line based, so it may not be for everyone. But it is free, open source, and insanely powerful. It is also easy to use if you remember the syntax. The -r parameter determines the input framerate. So you can change that value to make the video run faster or slower. Notice! Check the FFmpeg documentation for what the different mean. Once you have created a few videos the standard way, you realize that the biggest issues are reproducibility and the manual workflow involved. Preparing the model, setting the camera angle and framing the scene. These are things which I always end up doing multiple times before I get the result I want. And it takes forever. There are ways we can automate some of this with AnyScript classes such as AnyCameraLookAt and AnyCamRecorder. You can even create videos where the camera follows certain parts of your model or move around your model. All very nice. But it is also takes time to configure. So when I truly needed an awesome video, for example for a conference, I never have the time. The consequence has been that I make far fewer videos of my simulations than what I would like. To overcome all these issues I wrote a small plugin to create videos from your models with a single click. It is an AnyScript class_template which can be included into any model. It only takes a few lines of code to configure. It is hosted on GitHub, where you can download the code..
CameraLookAtPoint AnyVec3 The point the camera focus on. This can be fixed point or some moving point (r) on the model. CameraFieldOfView AnyFloat The vertical field of view in meters at the LookAtPoint. CameraDirection AnyVec3 The direction which the camera is placed. In global coordinate with respect to the LookAtPoint. This can also be a time varying vector. VideoInputFrameRate AnyInt Determines the speed of the video. Setting it to nStep/(tEnd-tStart) make the video run in real time. The Class also supports setting the video codec, video bit rate, video name, and more. See the full documentation for a complete list of options. Once added, some new operations will appear in the model tree. The class does not record what the ModelView shows. Instead the camera view is configured programmatically. The class members CameraLookAtPoint, CameraDirection, and CameraFieldOfView define what the camera records. This is really nice since it allows us to get consistent videos. To get a preview of what the camera sees, select and run the Preview operation. It will collect a single frame and launch the Windows image viewer. A single images will automatically open once you run the Preview operation. Once you are satisfied with the camera settings you are ready create a full video. 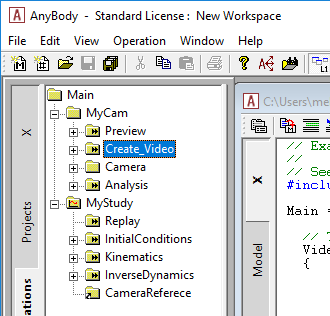 To create a video simply select and run the Create_Video operation. That will run the model, collect the frames, convert them to a video and finally play the video. The video will by default be saved together with the main file of the model. This can of course be customized as well. The AnyScript template is hosted on GitHub, where you can also find a few examples that shows how it works. As well as documentation on the class_template and the options which are available.